2015-04-03 Assigned to MICROVENTION, INC. reassignment MICROVENTION, INC. ASSIGNMENT OF ASSIGNORS INTEREST (SEE DOCUMENT FOR DETAILS). 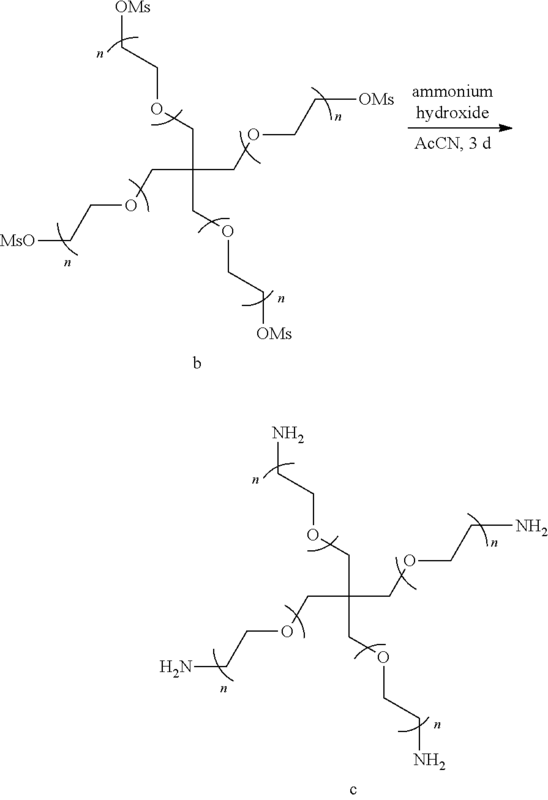 Assignors: CRUISE, GREGORY M., CONSTANT, MICHAEL J., HARRIS, CLAYTON G.
Polymers are described herein comprising: a reaction product of a prepolymer solution including at least one macromer and at least one visualization agent; and an active agent electrostatically bound to the polymer filament or chemically bound to the at least one monomer; wherein the polymer filament does not include metallic support members. This application claims the benefit of U.S. provisional patent application No. 61/986,015, filed Apr. 29, 2014, the entire disclosure of which is incorporated herein by reference. The present description provides polymers and polymer filaments for the occlusion of vascular sites and cavities within the body, such as the embolization of vascularized tumors or arteriovenous malformations including active pharmaceutical agents that can be released in situ. 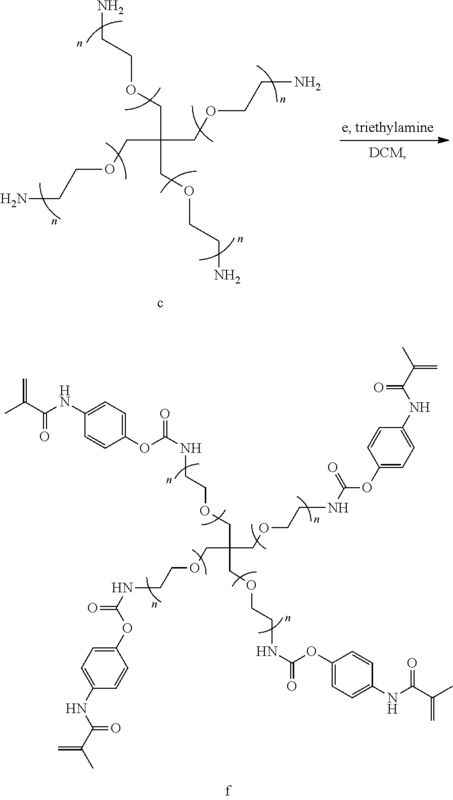 Described herein generally are polymer and/or hydrogel filaments configured to deliver pharmaceutical agents in situ. These polymers and/or hydrogels can also be optionally configured for embolization. In other embodiments, the polymers and/or hydrogels can be delivered in such a manner not to substantially occlude flow through a vessel or other lumen. The polymer filaments can include one or more monomers and/or macromers and a pharmaceutical agent(s) or other active agent(s). The polymer can optionally include a visualization agent. The pharmaceutical agent can be entrapped inside the polymers, loaded into the polymers after polymerization, or the pharmaceutical agent can be modified to permit polymerization into the polymers and released over time. To entrap the pharmaceutical agent in a polymer, the pharmaceutical agent can be dissolved into a pre-polymerization solution. As the polymerization of the polymer occurs, the pharmaceutical agent is entrapped by the polymer network. Then, once the polymer filament is delivered, the pharmaceutical agent can diffuse from the filament. In another embodiment, when the pharmaceutical agent is loaded into the polymer after polymerization, a monomer that is capable of binding to the desired pharmaceutical agent is incorporated into the polymer and formed into a filament. Once the loaded filament is delivered, the pharmaceutical agent can diffuse from the filament. The pharmaceutical agent itself can also be modified to permit polymerization into the polymer and release over time from the filament. 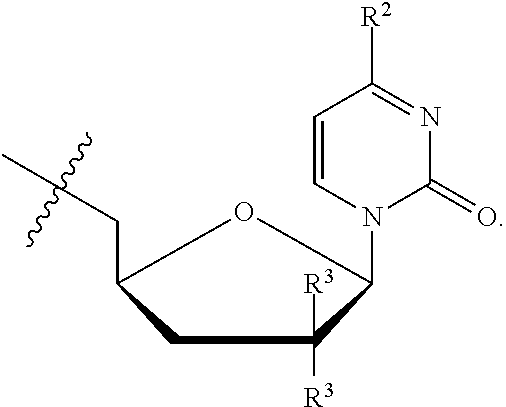 For example, a polymerizable group with a degradable linkage can be attached to the pharmaceutical agent thereby permitting both polymerization into the polymer and subsequent release from the filament. p is 0, 1, 2, 3 or 4. X5 is O, CH2, or NH. FIG. 1 illustrates a graph of gemcitabine eluted over time. 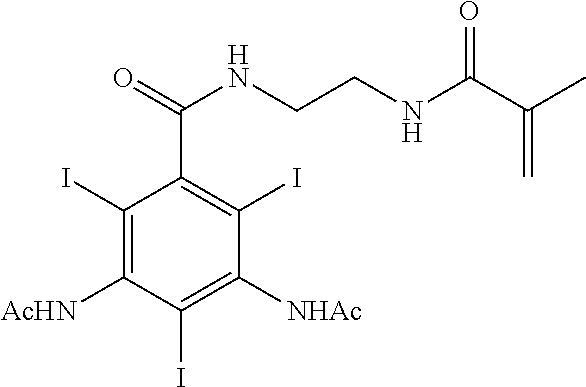 Described herein are polymers such as hydrogels formed as filaments or other elongated structures that can contain one or more active agents, pharmaceutical agents, drugs and the like. Herein, active agent, pharmaceutical agent, and drug can be used interchangeably. These polymer filaments can provide controlled release of the pharmaceutical agent(s) in situ. In one embodiment, the polymers can include (i) one or more macromers and (ii) one or more pharmaceutical agents. In another embodiment, the polymers can include (i) one or more monomers, one or more macromers, and/or one or more crosslinkers, and (ii) one or more pharmaceutical agents. In still another embodiment, the polymers can include (i) one or more crosslinkers and (ii) one or more pharmaceutical agents. The polymers can optionally include (iii) one or more visualization agents. The polymers described can be formed from a prepolymer solution. A particular combination of monomers/macromers/crosslinkers can provide differing polymeric physical properties. Different polymeric physical properties can include, but are not limited to tensile strength, elasticity, and/or delivery through a microcatheter or catheter. The polymers described herein can be provided as filaments or other elongated structures with round, square, rectangular, triangular, pentagonal, hexagonal, heptagonal, octagonal, ellipsoidal, rhomboidal, torx, or star-shaped cross-sectional shapes. A filament can be described as having a three dimensional shape such as, but not limited to a thread, string, hair, cylinder, fiber, or the like. The filament can be elongated meaning that its length exceeds its width or diameter by at least 5, 10, 15, 20, 50, 100, 500, 1,000, 10,000, 100,000, 1,000,000, 10,000,000, 100,000,000, or more times. Monomers used to form the herein described polymers can have low molecular weights and/or can contain a single polymerizable group. If present, the monomer(s) can aid in polymerization and impart specific mechanical properties to the resulting polymer filament. The monomers can be any molecule with a single functionality and conducive to a desired mechanical property. Specific monomers can include, but are not limited to, t-butyl acrylamide, 2-hydroxyethyl methacrylate, hydroxypropyl acrylate, hydroxyl butylacrylate, and derivatives thereof. The hydrophobicity and bulky structure of these specific monomers can impart column strength to the resulting polymer filament. In some embodiments, a visualization agent can be a monomer and incorporated into the polymeric structure. Monomers incorporating visualization characteristics can include one or more halogen atoms. For example, monomers can include 1, 2, 3, 4, 5, 6, 7 or more halogen atoms. In some embodiments, the halogen atoms can be Br or I. In one embodiment, the halogen atoms are I. In the above structure, one or more iodine atoms can be replaced by bromine. Again, in the above structure, one or more iodine atoms can be replaced by bromine. Monomers, if present, can be present at a concentration of about 5% w/w, about 10% w/w, about 15% w/w, about 20% w/w, about 25% w/w, about 30% w/w, about 35% w/w, about 40% w/w, about 45% w/w, about 50% w/w, at least about 5% w/w, between about 5% w/w and about 40% w/w, between about 10% w/w and about 50% w/w, between about 5% w/w and about 30% w/w, or between about 5% w/w and about 20% w/w, of the prepolymer solution. Macromers described herein can include large molecular weight compounds such as polymers having one or more reactive groups. In some embodiments, macromers with solubility in solvents and functional groups amenable to modifications may be preferred. Polyethers, due to their solubility in a variety of solvents, their availability in a variety of forms, and their available hydroxyl groups, may be preferred macromers. Other macromers can include, but are not limited to, poly(ethylene glycol), poly(propylene glycol), and poly(tetramethylene oxide). In other embodiments, a low molecular weight, branched macromer may be used. Such a low molecular weight, branched macromer can include at least three reactive moieties per molecule so that a high crosslink density of the finalized polymer can be achieved. 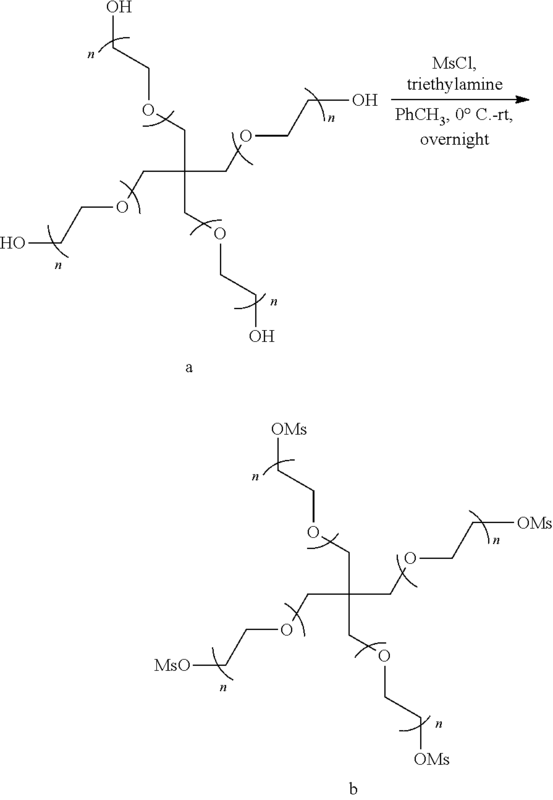 Example low molecular weight, branched macromers can include ethoxylated pentaerythritol having four end groups per molecule, and ethoxylated trimethylolpropane having three end groups per molecule. In still other embodiments, non-polyether polymers with functional groups available for modification, such as poly(vinyl alcohol), can also be used as macromers. Macromers can be present at a concentration of about 10% w/w, about 15% w/w, about 20% w/w, about 25% w/w, about 30% w/w, about 35% w/w, about 40% w/w, about 45% w/w, about 50% w/w, at least about 10% w/w, between about 10% w/w and about 40% w/w, between about 15% w/w and about 25% w/w, between about 15% w/w and about 50% w/w, or between about 15% w/w and about 30% w/w, of the prepolymer solution. In one embodiment, the macromer concentration is about 15% w/w of the prepolymer solution. The molecular weight of the macromer can alter the mechanical properties of the resulting polymer or hydrogel filament. In some embodiments, the alteration of the mechanical properties can be substantial. Smaller molecular weights result in polymers with sufficient column strength to be pushed through microcatheters and catheters when formed as a filament or other elongated structures. Larger molecular weights can result in polymer filaments that can be pushed through microcatheters and catheters with more difficulty. As such, the macromers described herein can have a molecular weight of about 50 g/mole, about 100 g/mole, about 200 g/mole, about 300 g/mole, about 400 g/mole, about 500 g/mole, about 1,000 g/mole, about 1,500 g/mole, about 2,000 g/mole, about 2,500 g/mole, about 3,000 g/mole, about 3,500 g/mole, about 4,000 g/mole, about 4,500 g/mole, about 5,000 g/mole, at least about 50 g/mole, at least about 100 g/mole, between about 50 g/mole and about 5,000 g/mole, between about 100 g/mole and about 5,000 g/mole, between about 1,000 g/mole and about 5,000 g/mole, between about 100 g/mole and about 1,000 g/mole, or between about 500 g/mole and about 1,000 g/mole. In one embodiment, the molecular weight is between about 500 g/mole to about 1,500 g/mole. 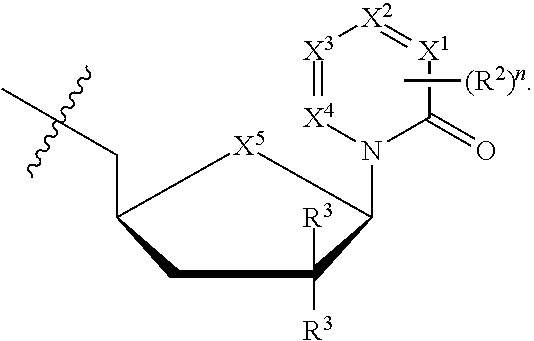 Crosslinkers can also be optionally utilized to impart further cross-linking of the resulting polymer. The crosslinker can be any molecule with at least two functionalities to incorporate into the resulting polymer filament. The crosslinker can also be a structure conducive to the desired mechanical property imparted on the finalized polymer filament. Crosslinkers can include an ester, a carbonate, a thioester, or a combination thereof. In other embodiments, multiple of each of an ester, a carbonate, a carbamate, an oxalate, and/or a thioester can be included. 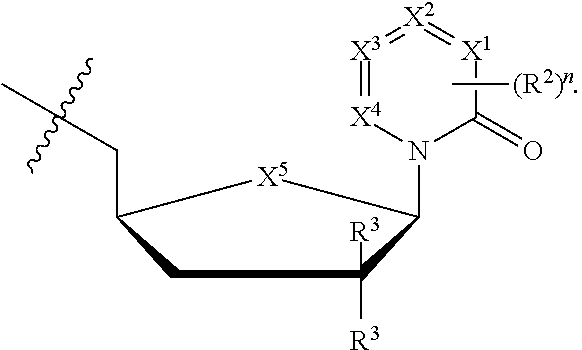 Other crosslinkers can include N,N-methylenebisacrylamide and ethylene glycol di methacrylate. In some embodiments, biodegradable crosslinkers can be used to allow for the filament to dissolve or otherwise breakdown when placed in vivo or in another appropriate in situ condition. wherein d, e, f, and g are each independently 1-20.
wherein each n is independently 1-20. The crosslinker(s) described herein can have a concentration less than about 5% w/w, less than about 4% w/w, less than about 3% w/w, less than about 2% w/w, less than about 1% w/w, or less than about 0.5% w/w of the prepolymer solution. In some embodiments, in order to polymerize the monomers/macromers/crosslinkers, all the components of the polymer have moieties conducive to a polymerization reaction. 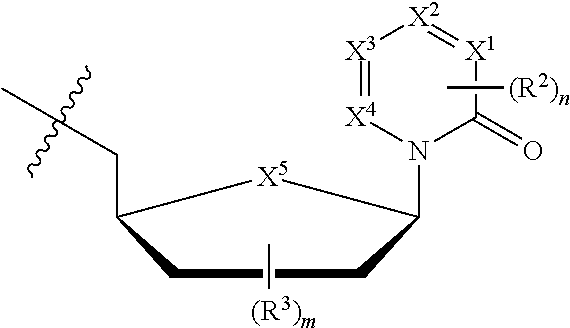 A preferred polymerization mechanism can be free radical polymerization. If free radical polymerization is utilized to prepare the hydrogel filaments, all components have ethylenically unsaturated moieties. Functionalities for free radical polymerization can include acrylates, methacrylates, vinyl groups, and derivatives thereof. In one embodiment, functional groups of the monomers/macromers/crosslinkers are acrylates and/or methacrylates. Alternatively, in other embodiments, other reactive chemistries can be utilized for the polymers. Other reactive chemistries can be nucleophile/N-hydroxysuccinimide esters, vinyl sulfone/acrylate, thiol-ene, or maleimide/acrylate. In some embodiments, the polymer can be designed to dissolve in vivo, or biodegrade. Linkages unstable in the physiological environment, and therefore biodegradable, can be introduced to the macromer or crosslinker to impart biodegradation by hydrolytic, oxidative, or reductive mechanisms. 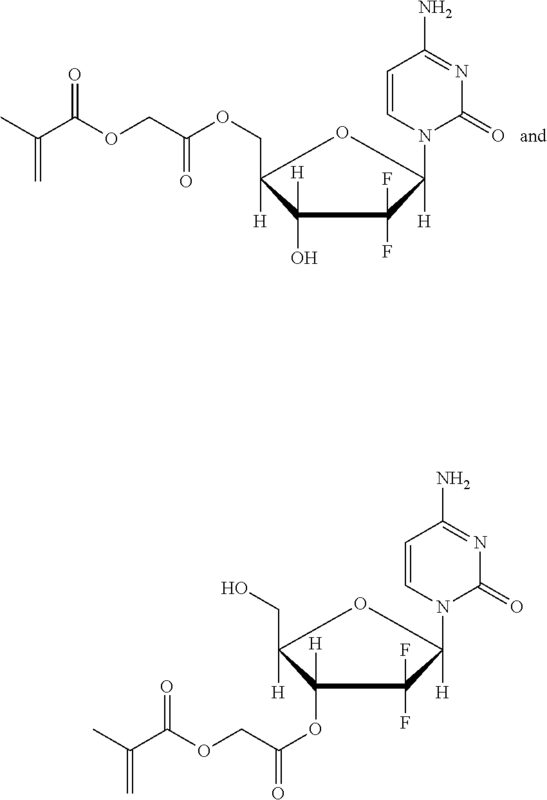 Linkages susceptible to breakage in a physiological environment include those susceptible to hydrolysis, including esters, thioesters, carbamates, oxalates, and carbonates, and those susceptible to enzymatic action, including peptides that are cleaved by matrix metalloproteinases, collagenases, elastases, and cathepsins. Multiple crosslinkers can be utilized to control the rate of degradation in a manner that is not possible with only one. In some embodiments, a multiple stage degradation can be achieved with differing crosslinkers. For example, crosslinkers with different degradation rates or modalities can be combined to provide a multimodal degradation pattern. A rapid initial degradation can could be achieved by using a rapid degrading crosslinker. A second slower degradation can be achieved by using a slow degrading crosslinker. Polymer filaments containing pharmaceutical agents can be made to be visible using medically relevant imaging techniques such as fluoroscopy, computed tomography, or magnetic resonant imaging to permit intravascular delivery and follow-up. Visualization of the polymer filaments under fluoroscopy can be imparted by incorporating solid particles of radiopaque materials such as barium, bismuth, tantalum, platinum, gold, and other dense metals into the polymer or by polymerizing iodine-containing molecules into the polymer filament. Visualization agents for fluoroscopy can include barium sulfate and iodine-containing molecules. In other embodiments, polymer visualization under computed tomography imaging can be imparted by incorporation of solid particles of barium or bismuth or by the incorporation of iodine-containing molecules polymerized into the polymer structure of the filament. Metals visible under fluoroscopy can sometimes result in beam hardening artifacts that may preclude the usefulness of computed tomography imaging for medical purposes. If used as a visualization agent to render the polymer visible using fluoroscopic and computed tomography imaging, barium sulfate can be present at a concentration of about 20% w/w, about 30% w/w, about 40% w/w, about 50% w/w, about 60% w/w, about 70% w/w, at least about 20% w/w, between about 30% w/w and about 60% w/w, between about 20% w/w and about 70% w/w, or between about 40% w/w and about 50% w/w of the prepolymer solution. In some embodiments, the polymer can be visualized using fluoroscopic and computed tomography imaging when it includes about 100 mg, about 125 mg, about 150 mg, about 175 mg, about 200 mg, about 225 mg, about 250 mg, about 275 mg, about 300 mg, about 325 mg, about 350 mg, about 375 mg, about 400 mg, about 425 mg, about 450 mg, about 475 mg, about 500 mg, at least about 100 mg, at least about 125 mg, at least about 150 mg, between about 100 mg and about 500 mg, between about 125 mg and about 300 mg, or between about 100 mg and about 300 mg of iodine per gram of polymer. Visualization of the filaments under magnetic resonance imaging can be imparted by incorporation of solid particles of superparamagnetic iron oxide or gadolinium molecules polymerized into the polymer structure. In one embodiment, a preferred visualization agent for magnetic resonance is superparamagnetic iron oxide. The particle size of the solid particles can be about 5 μm, about 10 μm, about 15 μm, about 20 μm, about 25 μm, between about 10 μm and about 25 μm, or between about 5 μm and about 15 μm. Concentrations of superparamagnetic iron oxide particles to render the hydrogel visible using magnetic resonance imaging range from 0.1% to 1% w/w of the prepolymer solution. 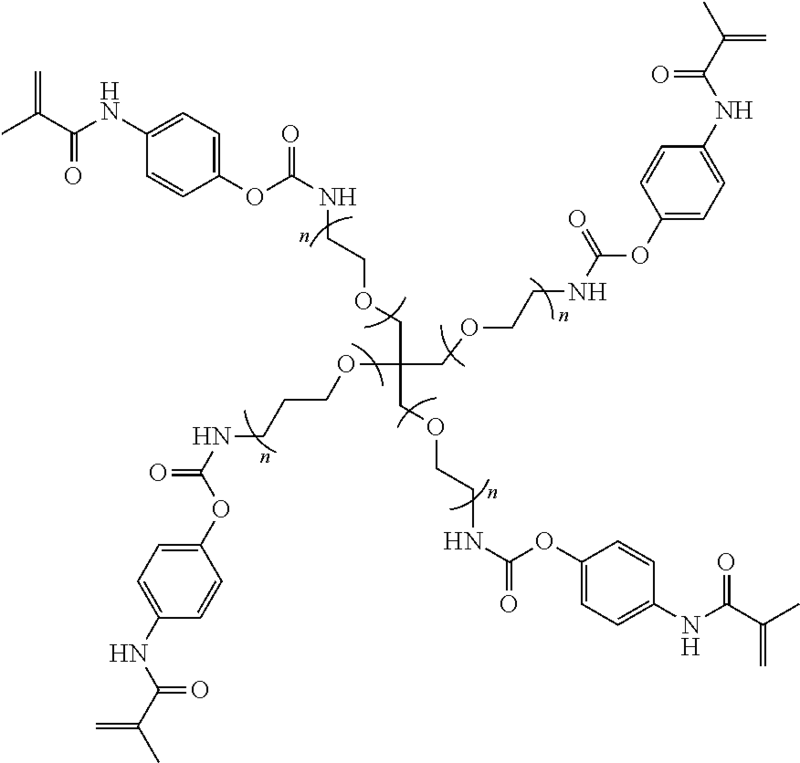 Pharmaceutical agents can be incorporated into the polymer filaments described herein in many different ways. Pharmaceutical agents can be any compound or drug having a therapeutic effect in an animal such as but not limited to active agents, drugs, therapeutic agents, and the like. Pharmaceutical agents can be in an active or inactive form when introduced into the filaments or when delivered. 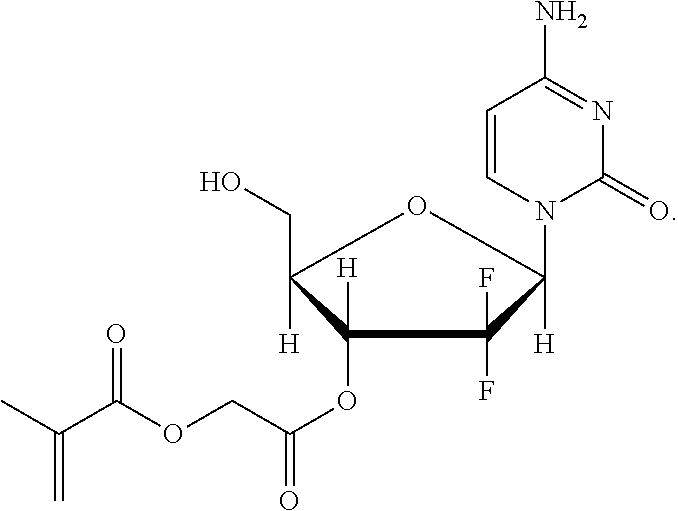 Pharmaceutical agents can include, but are not limited to anti-proliferative compounds, cytostatic compounds, toxic compounds, anti-inflammatory compounds, chemotherapeutic agents, analgesics, antibiotics, protease inhibitors, statins, nucleic acids, polypeptides, growth factors and delivery vectors including recombinant micro-organisms, liposomes, and the like. In a first method of incorporation, the pharmaceutical agent(s) can be entrapped in the polymer structure of the polymer filament. In one embodiment, the pharmaceutical agent is dissolved in the prepolymer solution and then it is entrapped in the network of the polymer as it is polymerized and formed as a filament. Once the filament is delivered to the diseased or otherwise desired site, the pharmaceutical agent diffuses out of the polymer filament. Advantages of this embodiment can include simplicity and being able to incorporate a wide variety of pharmaceutical agents into the polymer filaments. In some embodiments, it may necessary to match the solubility of the polymer components and the pharmaceutical agent(s). Secondly, the pharmaceutical agent(s) can be loaded into the polymer. In this embodiment, monomers/macromers/crosslinkers are incorporated into the polymer network that can bind the desired pharmaceutical agent. While any binding mechanism can be used, a preferred binding mechanism is electrostatic interaction. In one embodiment, a monomer with an ionizable functional group that is basic (e.g. amines, derivatives thereof, or combinations thereof) can be incorporated into the polymer. The amine group is protonated at pH's less than the pKa of the amine, and deprotonated at pH's greater than the pKa of the amine. The incorporation of amine groups into the polymer can permit the incorporation of negatively charged pharmaceutical agents through electrostatic interaction. In another embodiment, a monomer with an ionizable functional group that is acidic (e.g. carboxylic acids, sulfonic acids, phosphoric acids, derivatives thereof, or combinations thereof) can be incorporated into the polymer network. The acid group is deprotonated at pH's greater than the pKa of the acid, and protonated at pH's less than the pKa of the acid. The incorporation of acidic groups into the polymer can permit the incorporation of positively charged pharmaceutical agents through electrostatic interaction. After the preparation and washing of the polymer filament, the pharmaceutical agent is dissolved into a suitable aqueous solvent and the polymer filament is placed in that solution. The pharmaceutical agent is loaded into the polymer filament. Once the polymer filament is delivered to the diseased site, the pharmaceutical agent is released by exchange with other counter ions readily available in the physiological environment and diffuses out of the polymer filament. The advantages of this embodiment include simplicity, the ability to wash the polymer filament before loading with the pharmaceutical agent, and potentially higher loadings of pharmaceutical agents. In a third way, the pharmaceutical agent(s) can be incorporated into the polymer filament. 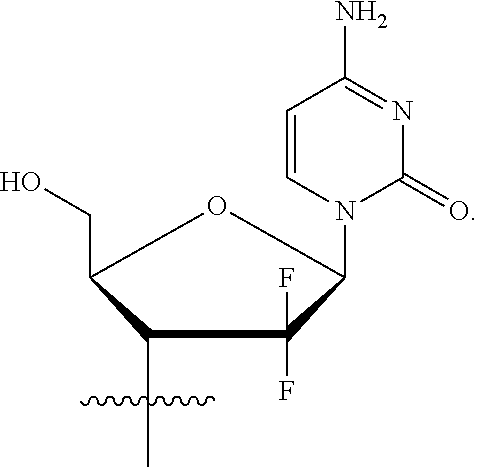 In this embodiment, the pharmaceutical agent is chemically modified to permit incorporation into the network of the filament and to permit decoupling from the polymer in a controlled rate at the diseased site. The incorporation can be achieved by adding a moiety amenable to the polymerization mechanism selected for the polymer. The modification turns the pharmaceutical agent into a monomer. The decoupling is achieved by adding a linkage unstable in a physiological environment between the polymerization group and the active agent. 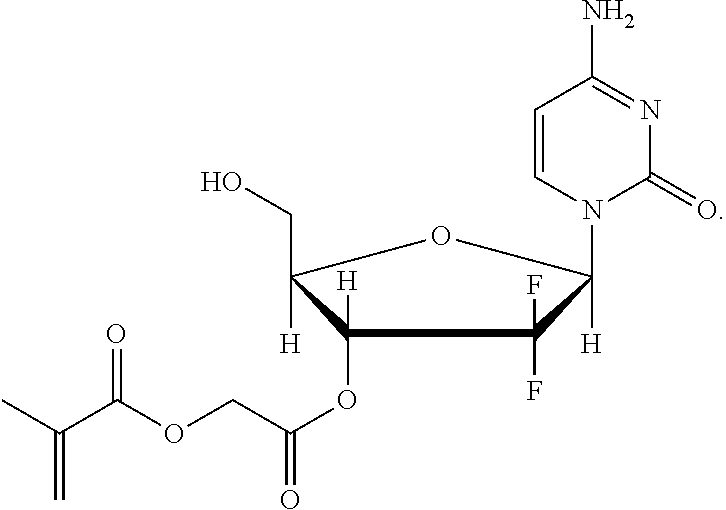 This linkage can break via hydrolytic, oxidative, or reductive mechanisms available in the physiological environment. Linkages susceptible to breakage in a physiological environment include those susceptible to hydrolysis, including esters, thioesters, carbamates, oxalates, and carbonates, and those susceptible to enzymatic action, including peptides that are cleaved by matrix metalloproteinases, collagenases, elastases, and cathepsins. Multiple decoupling linkages can be used to control the rate of release of the pharmaceutical agent in a manner that is not possible with only one, i.e. one linkage to permit a large, rapid release immediately following implantation and another linkage to permit a slow, sustained release over longer periods of time. After preparation of polymers with incorporated active agents, extensive washing of the polymers may not prematurely release the pharmaceutical agent. Once the polymer is delivered to the diseased site, the pharmaceutical agent decouples from the polymer as the linkage breaks and diffuses into the diseased site. Advantages of this embodiment include the ability to wash the polymer filament before loading with pharmaceutical agent, highest loadings of pharmaceutical agents, complete control of the release kinetics, and suitability of the widest range of pharmaceutical agents. can be used. Combination ratios can be about 1:99, about 10:90, about 20:80, about 30:70, about 40:60, about 50:50, about 60:40, about 70:30, about 80:20, about 90:10, or about 99:1. 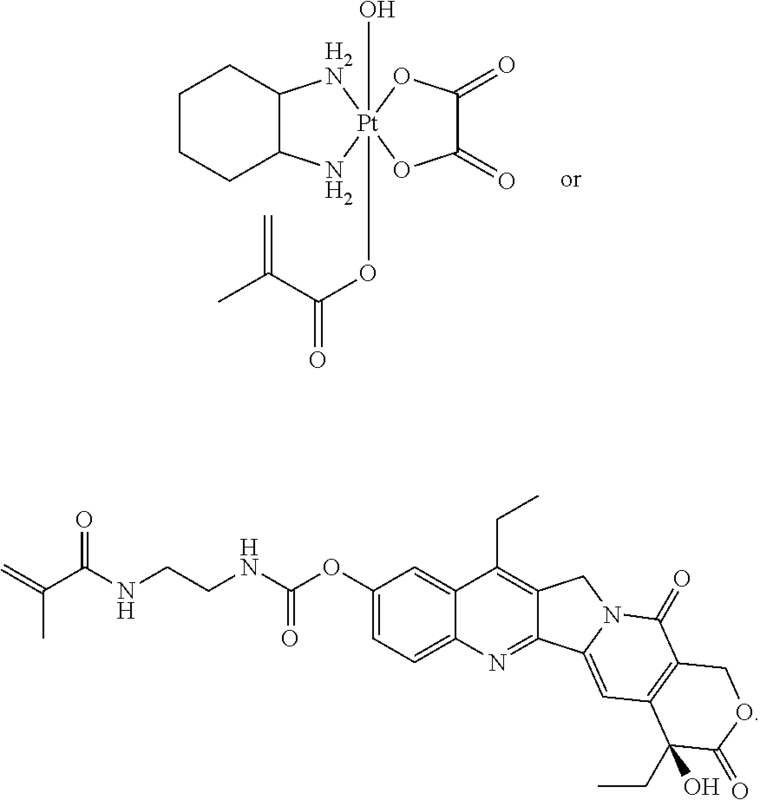 Also, various combinations of the above listed pharmaceutical agents can be used with filaments as described herein. Methods of forming the polymer filaments are also described. Methods of forming therapeutic polymer filaments or other elongated structures can comprise: reacting a prepolymer solution. The prepolymer solution can include at least one macromer, at least one visualization agent, and a pharmaceutical agent physically entrapped in the polymer filament, electrostatically bound to the polymer filament or chemically bound to the polymer matrix. In another embodiment, the prepolymer solution can include (i) one or more macromers and (ii) one or more pharmaceutical agents. In another embodiment, the prepolymer solution can include (i) one or more monomers, one or more macromers, and/or one or more crosslinkers, and (ii) one or more pharmaceutical agents. In still another embodiment, the prepolymer solution can include (i) one or more crosslinkers and (ii) one or more pharmaceutical agents. 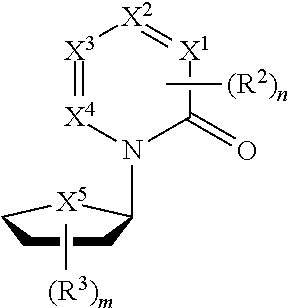 The prepolymer solution can optionally include (iii) one or more visualization agents. Different combinations of monomers/macromers/crosslinkers can provide differing physical properties for the resulting polymers. Different polymeric physical properties can include, but are not limited to tensile strength, elasticity, and/or delivery through a microcatheter or catheter. The resulting polymers and/or polymer filaments can include one or more pharmaceutical agents physically entrapped in the polymer filament, electrostatically bound to the polymer filament or chemically bound to the at least one monomer. The resulting polymer filament can be prepared for implantation. After formation, the polymer filament can be loaded into a support member. The support member can be formed of a metal. In other embodiments, the support member is not formed of a metal, but rather formed of a material such as a plastic or other polymer. In other embodiments, the polymer filaments do not require any support members to be delivered. For example, to prepare a polymer such as in the shape or form of a filament or other elongated structure, a tubular extrusion is filled with prepolymer solution. The extrusion is the mold for the filament. In some embodiments, if one of the components is solid, a solvent will be utilized in the preparation of the filaments. If liquid components are utilized, a solvent may not be required, but may be desired. Any aqueous or organic solvent may be utilized that fully dissolves the desired monomers/macromers/crosslinkers, soluble visualization agents, pharmaceutical agents, and polymerization initiators may be used. Solvents can include but are not limited to water, methanol, ethanol, isopropyl alcohol, ether, dimethylformamide, and the like. Solvent concentrations can be about 10% w/w, 20% w/w, 30% w/w, 40% w/w, 50% w/w, 60% w/w, 70% w/w, 80% w/w, between about 20% w/w and about 80% w/w, between about 20% w/w and about 50% w/w, or between about 40% w/w and about 80% w/w. In one embodiment, the solvent is dimethylformamide. The prepolymer solution can be polymerized by reduction-oxidation, radiation, heat, or any other method known. Radiation cross-linking of the prepolymer solution can be achieved with ultraviolet light or visible light with suitable initiators or ionizing radiation (e.g. electron beam or gamma ray) without initiators. Cross-linking can be achieved by application of heat, either by conventionally heating the solution using a heat source such as a heating well, or by application of infrared light to the monomer or prepolymer solution. Free radical polymerization of the prepolymer solution in some embodiments is preferred and may require an initiator to start the reaction. 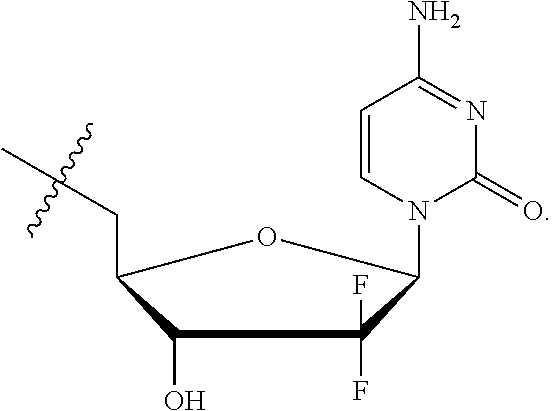 In a preferred embodiment, the cross-linking method utilizes azobisisobutyronitrile (AIBN) or another water soluble AIBN derivative (2,2′-azobis(2-methylpropionamidine)dihydrochloride). Other useful initiators can include N,N,N′,N′-tetramethylethylenediamine, ammonium persulfate, benzoyl peroxides, and combinations thereof, including azobisisobutyronitriles. Initiator concentrations can be about 1% w/w, about 2% w/w, about 3% w/w, about 4% w/w, about 5% w/w, between about 0.5% w/w and about 5% w/w, between about 1% w/w and about 3% w/w, or between about 2% w/w and about 3% w/w. 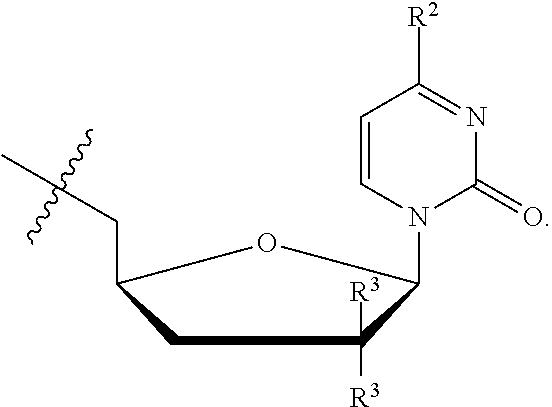 In one embodiment, azobisisobutyronitrile is used as an initiator. In some embodiments, the prepolymer solution is prepared by placing the monomer/macromer/crosslinker, visualization agent, pharmaceutical agent, and initiator in the solvent. After dissolution of these components, an insoluble visualization agent, such as barium sulfate or superparamagnetic iron oxide particles, can be suspended in the prepolymer solution. In other embodiments, this insoluble visualization agent is not used. Mixing of the prepolymer solution containing an insoluble visualization agent with a homogenizer can aid the suspension of the insoluble visualization agent. The prepolymer solution can then be injected into tubing with an inner diameter ranging from 0.015 cm to 0.19 cm and incubated for several hours at elevated temperature or in boiling water, i.e. 100° C., and subsequently overnight at 80° C. to complete polymerization. Immersion in boiling water allows for rapid heat transfer from the water to the prepolymer solution contained in the tubing. The selection of the tubing imparts micro catheter or catheter compatibility. For delivery through microcatheters, tubing diameters from about 0.006 in to about 0.025 in can be used. In one embodiment, the tubing is made from HYTREL® (DuPont, Wilmington, Del.). The HYTREL® tubing can be dissolved in solvents, facilitating removal of a polymer filament from the tubing. If the tubing is wrapped around a mandrel prior to polymerization of the prepolymer solution, the resulting hydrogel filament maintains the shape of the wrapped tubing. Using this wrapping technique, helical, tornado, and complex shapes can be imparted to the finalized filaments. When the tubing is wrapped around a mandrel, the use of oval tubing may be preferred. After wrapping around the mandrel, the oval shape of the tubing is rounded and the resulting hydrogel filament has a round shape in the coiled configuration. If HYTREL® tubing is utilized, the hydrogel filament can be recovered by incubating the tubing in a solution of 20% w/w phenol in chloroform followed by washing in chloroform and ethanol. After the filament is washed, it is dried. Filaments or other elongates structures formed using the present methods can vary in length depending on the method parameters used. However, generally, filament lengths can range from about 0.5 cm to about 100 cm, about 1 cm to about 50 cm, about 10 cm to about 100 cm, or about 0.5 cm to about 25 cm. Likewise diameters can vary. For example, diameters can be about 0.010 cm to about 0.50 cm, about 0.015 cm to about 0.19 cm, or about 0.010 cm to about 0.20 cm. After recovery and washing of the filament, it is fabricated into a device suitable for use by a physician, surgeon, or other practitioner. If a repositionable device is desired, a length of filament is inserted into a tube slightly larger than the filament's diameter. This straightens the secondary shape of the filament and permits the gluing of a poly(ether-ether-ketone) coupler to one end of the filament. Subsequently the coupler is attached to a pusher, packaged, and sterilized. Upon receipt, the physician introduces the filament into a microcatheter or catheter and then pushes it through the microcatheter or catheter to an embolization or other medically relevant site. The filament can be advanced and withdrawn until the physician is satisfied with its position. Then the filament can be detached from the pusher. If a pushable device is desired, a dried hydrogel filament is loaded into an introducer, packaged in a suitable pouch, and sterilized. Upon receipt, the physician transfers the hydrogel from the introducer to a microcatheter or catheter using a guide wire or stylet. The dried filament is then pushed through the microcatheter or catheter and into an embolization site or other medically relevant site using a guide wire. 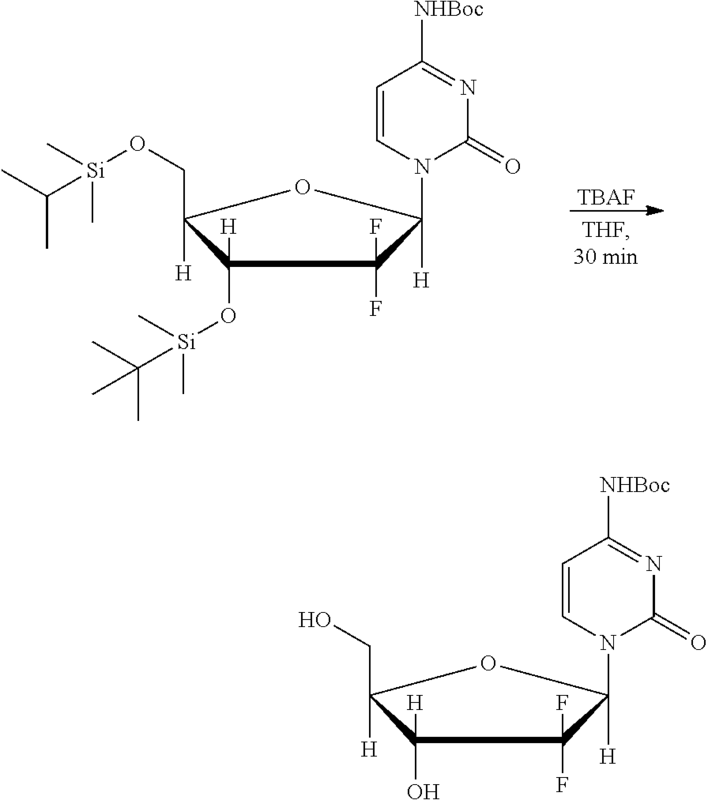 To prepare a hydrogel filament with entrapped active pharmaceutical agent, 2.25 g of trimethylolpropane triacrylamide, 1.25 g of barium sulfate and 0.2 g of gemcitabine hydrochloride were added to 2.5 g of water. The solution was sparged with argon for 10 min. To initiate polymerization, 20 μL of tetramethylethylenediamine and 12 μL of a 20% solution of ammonium persulfate in water was added just before injection into 0.045 inch ID polyethylene tubing using a 1 cc syringe. The tubing was heat sealed at both ends and allowed to polymerize overnight at room temperature. Once polymerized, the tubing was cut into 15 cm sections and placed in a vacuum oven to remove any residual water. Once dry, the hydrogel filaments were pushed out of their tubes using a mandrel. 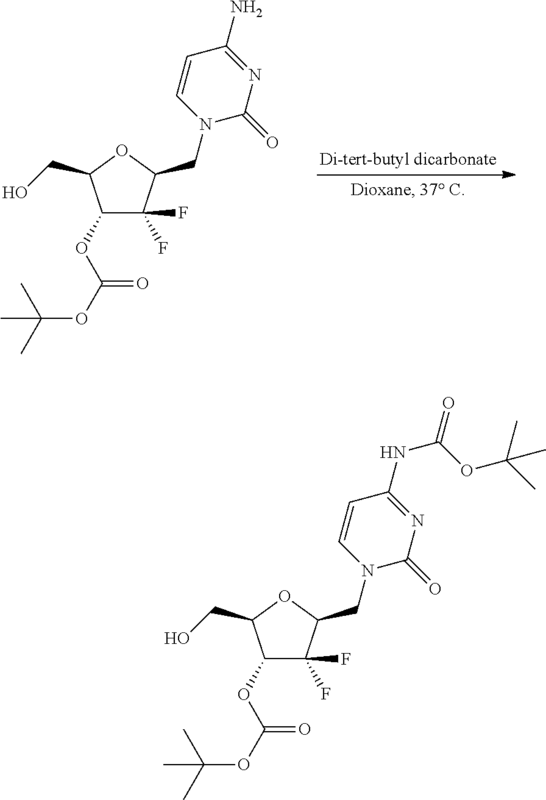 The gemcitabine-containing hydrogel filaments were washed in ethanol for 2 hr to remove any unreacted components, then dried overnight in a vacuum oven. To 400 mL of methanol was added 104 g (170 mmol) of diatrizoic acid followed by 28 g of cesium carbonate (65 mmol). After stirring for 45 min the methanol was removed in vacuo and the solids suspended in 500 mL of diethyl ether. The solids were then collected and dried on a Buchner funnel and further dried in vacuo, to yield 120 g, (95%) (Cesium Diatriozate, 1). To 24 mL of HEMA (200 mmol) in 1,000 mL of dry ether was added 16.8 mL (213 mmol) of pyridine at 4-10° C., under Ar. To this solution was added 21.3 mL (200 mmol) of 1-chloroethyl chlorocarbonate, drop wise with stirring over 0.5 hr. After stirring 0.5 hr at 4-10° C., the heavy precipitate was removed by filtration and the filtrate was concentrated to oil in vacuo, yielding 44 g (100%) (HEMA-1-Chloroethyl carbonate, 2). To 44 g (200 mmol) of (2) in 400 mL of anhydrous DMF was added 30 g (40 mmol) of (1) at 100° C. under Ar, with good stirring. After 15 min another 40 g (54 mmol) of (1) was added at 100° C., under Ar, with good stirring followed by a final 30 g (40 mmol), under the same conditions, for a total of 110 g (1) (134 mmol). The reddish brown reaction mixture was heated at 100° C. for an additional hour and the solvent was removed in vacuo. The reddish brown solid residue was suspended in 1,000 mL of dry ether and the solids were collected on a Buchner funnel. After the solids were dried in vacuo, they were suspended in 500 mL distilled water at 2,000 rpm and the mixture pH was adjusted to 8-9 with cesium carbonate. After stirring for 10 min, the suspension was filtered and the solids were washed 3 times with 100 mL of distilled water, dried overnight in vacuo and crushed to a fine powder. Solid residue was again suspended in 1,000 mL of dry ether and the solids were collected on a Buchner funnel. After the solids were dried in vacuo again and crushed to a fine powder again, they were purified by silica gel chromatograph using a 1.5 Kg column and a 0-10% gradient of methanol in dichloromethane, over 1 hr. This yielded 26 grams (18%), very pale yellow crystalline solid (1-((2-(methacryloyloxy)ethoxy)carbonyloxy)ethyl-3,5-diacetamido-2,4,6-triiodobenzoate, 3). Diatriazoyl Acetate (A): To 30.8 g of diatrizoic acid suspended in 100 mL of acetic anhydride was added 2 g of concentrated sulfuric acid and the resulting suspension stirred at 90 degrees centigrade for one hour before the reaction mixture was cooled to room temperature and then poured onto 500 g of ice. After agitating the ice for 15 min, the oily mass was treated with 100 mL of half saturated sodium bicarbonate whilst agitating. The solids which had formed were collected on a Buchner funnel and dried overnight in vacuo to give 9 g of light brown diatriazoyl acetate solids. Diatriazoyl Chloride (B): Nine grams of ditriazoyl acetate was suspended in 100 mL of thionyl chloride using overhead stirring. The reaction mixture was brought to reflux in an oil bath and refluxed for one hour. The thionyl chloride was mostly removed in vacuo at 40° C. at which point solids were re-suspended in 100 mL of ethyl acetate which was removed in vacuo. This process was repeated twice more at which point the solids were placed under vacuum overnight. 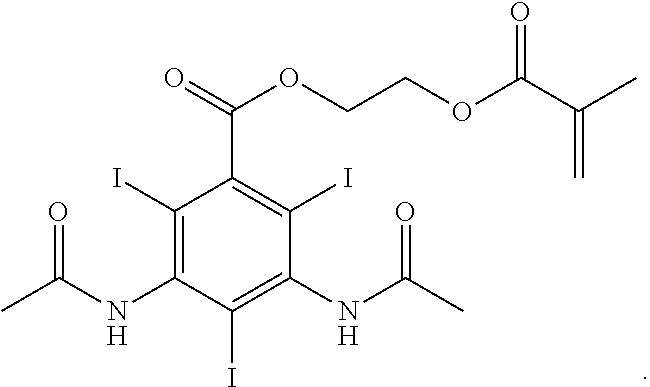 Ethylenediamine mono-diatriazoyl amide (C): 6.3 g of the acid chloride (10 mmol) in 300 mL of methylene chloride was added to 6.7 grams of ethylene diamine (100 mmol) over one hour with stirring at 4-10° C. under Ar. The formed solids were collected on a Buchner funnel and washed with 100 mL of methylene chloride and dried overnight in vacuo. The dried solids now largely free of ethylenediamine were taken up in 600 mL of water filtered through a fritted disk funnel and the water removed in vacuo. The residue was triturated with acetonitrile which was then evaporated in vacuo to remove traces of water. LC-MS showed 640 which is (M+Na)+ and 656.9, (M+K)+. Ethylene diamine-1-diatriazoylamide-2-methacrylamide (D): To 650 mg of (C) (1 mmol) suspended in 100 mL of THF/CHCl3/ethanol, 1/3/1 was added 0.18 mL (1.04 mmol) of diisopropylethylamine followed by 0.12 mL (1.26 mmol) of methacryoyl chloride with stirring under Ar. The reaction mixture was stirred for 1 hr at which point reaction mixture was filtered with a fritted Buchner funnel. TLC with 10% methanol in methylene chloride showed potential product in solids and filtrate. LC-MS of combined filtrate and solids after solvent removal in vacuo showed (M+H)+ at 725.0, (M+Na)+ at 747.0 as well as (M−H)− at 723.0 and (M+Na−2H)− at 744.9 all on an HPLC peak at 8.9 min in a 15 min run. Tetrabutylammonium diatrizoate: To a stirring suspension of diatrizoic acid (50 g, 81.4 mmol) in methanol (552 mL) was slowly added tetrabutylammonium hydroxide (40% aqueous solution, 52.8 mL). The turbid suspension turned clear after the addition of tetrabutylammonium hydroxide was finished. The solvent was removed using a rotary evaporator to obtain a cream-colored viscous residue. To this residue was added appropriate amount of toluene, which was then removed using a rotary evaporator. Toluene was added to the residue once more and removed again. The solid obtained was dried in a vacuum oven overnight at 40° C. to afford a white solid (64.1 g, 92% yield). 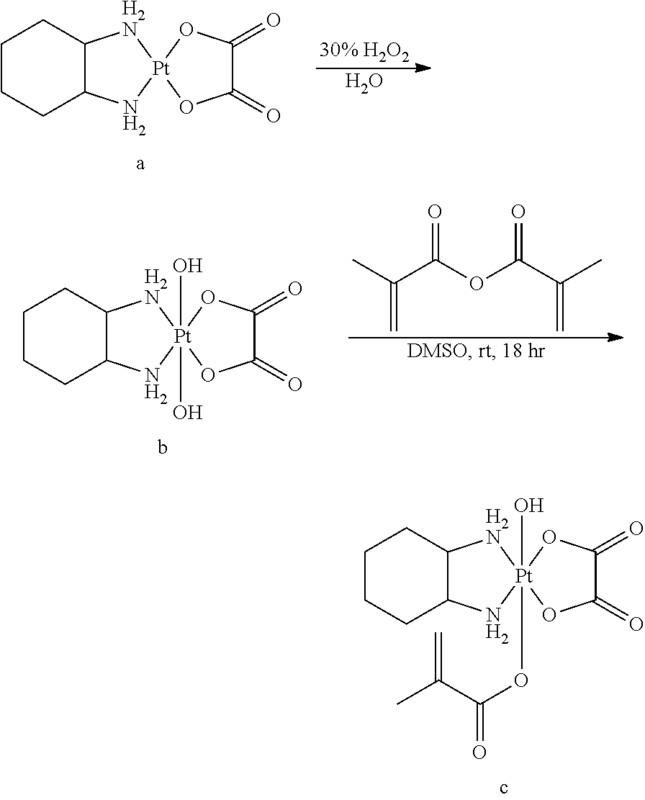 Diatrizoyl HEMA: To a stirring solution of KI (796.8 mg, 4.38 mmol) and 2-chloro ethylmethacrylate (4.32 mL, 32.1 mmol) in anhydrous DMF (122.6 mL) was added tetrabutylammonium diatrizoate (25 g, 29.2 mmol) under argon. The flask was place in a 60° C. oil bath. Additional KI (199 mg) and 2-chloro ethylmethacrylate (1 mL) was added to the reaction at 13 hours, 38 hours and 41 hours reaction times. The reaction was pulled out of the oil bath at 44 hours and cooled under room temperature. The reaction was poured over saturated NaHCO3 aqueous solution (120 mL) and a white precipitate formed. The aqueous phase was extracted once with a mixture of ethyl acetate (280 mL) and methanol (50 mL). The organic phase was washed with saturated sodium chloride aqueous solution (300 mL×1). The organic phase was subjected to rotary evaporation to obtain a cream-colored wet solid. The solid was suspended in a mixture of methyl tert-butyl ether and chloroform (7:3, v/v), and the resulting suspension was filtered to obtain a white solid. The solid dried under reduced pressure to obtain the first crop of product as a white solid (11.898 g). The previous NaHCO3 phase was filtered and a white solid was collected. The solid was washed with a mixture of methyl tert-butyl ether and chloroform (7:3, v/v) and dried under reduced pressure to afford the second crop (3.071 g). The first and second crops were combined to afford the final product as a white solid (14.969 g, 70.6% yield). To 10 g (67.61 mnol) of 2,2′-ethylenedioxy-bis-ethylamine was added 10 g (70.4 mmol) of glycidyl methacrylate and 3.0 g of silica gel (Aldrich 645524, 60 Angstrom 200-425 mesh), with good stirring. After stirring for 1 hr, another 9 g (63.4 mmol) of glycidyl methacrylate was added and the suspension was stirred for an additional 1.5 hr. The reaction mixture was diluted with 200 mL of reagent grade chloroform and filtered through a 600 mL fritted glass Buchner funnel of medium porosity, to remove silica gel. LC-MS analysis of the resultant chloroform solution showed almost no mono-glycidyl amino alcohol and mostly bis-glycidyl amino alcohol at (M+H)+ 433 0.2 and was concentrated to about 50 g in vacuo. The resultant heavy syrup was diluted to 100 mL with acetonitrile and stored at −80° C.
TMP-Chloroacetamide (E): To 13.2 g of TMP amine in 250 mL of dry THF was added 6.32 g (80 mmol) of pyridine and this solution was added to 6.44 g of chloroacetyl chloride in 250 mL of THF with good stirring, at 4-1° C. under Ar. After stirring for 15 min, the reaction mixture was warmed to room temperature and the THF and other volatile materials were removed in vacuo. The resulting solids were dissolved into 200 mL of chloroform, washed with 100 mL of saturated aqueous sodium bicarbonate, dried over magnesium sulfate, and the solvent was removed in vacuo. 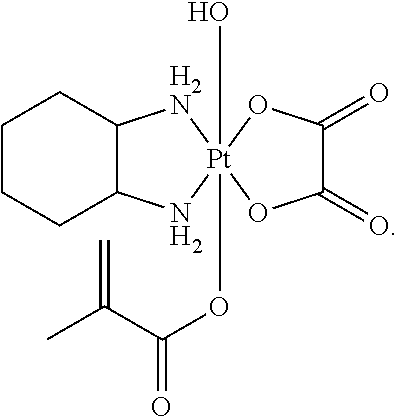 TMP-NH-Gly-Methacrylate (F): Approximately 15 grams of (E) was dissolved into 75 mL of anhydrous DMF and added 18 g of cesium methacrylate was added. The resulting suspension was heated at 40-50° C. for 2 hr. After precipitation with 500 mL of chloroform, the inorganic salts were collected by filtration and the filtrate was concentrated in vacuo to give 18 g of a reddish brown oil. This oil was polymerized with AIBN at 80° C., in isopropyl alcohol to a nice hard pellet. Chromatography on 6 g of this through a plug of silica with 1,200 mL of 2-20% methanol in chloroform, gave 6 g of light red colored material. This material can be used to prepare polymer filaments. 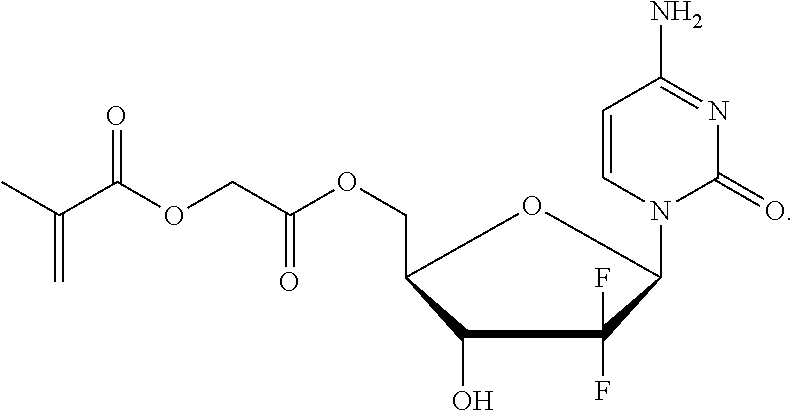 Preparation of tetramesyl pentaerythritol (b): To a 3 L three-neck round bottom flask fitted with a Dean-Stark trap was added pentaerythritol (a, MW˜797 g/mol, 99.9 g, 125 mmol) and toluene (1.5 L) sequentially. The solution was subjected to an azeotrope distillation and water was removed from the Dean-Stark trap. The flask was cooled to room temperature before triethylamine (94.6 mL, 530 mmol) was added. Then the flask was placed in a 0° C. ice bath. A 250 mL addition funnel was attached to the flask. To the addition funnel was added anhydrous toluene (80 mL) and mesyl chloride (40 mL, 530 mmol) sequentially. The mesyl chloride solution wad added dropwise to the cooled solution. The reaction was left to stir at room temperature overnight, resulting in the formation of a white precipitate. At the end of the reaction, the solution was filtered over a fritted glass funnel to remove the precipitate. The filtrate was concentrated using a rotary evaporator to afford the crude material as a pale yellow oil (86.37 g). 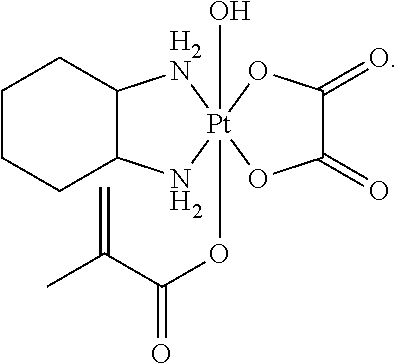 Preparation of tetraamino pentaerythritol (c): To a solution of ammonium hydroxide (30%, 1250 mL, 22.02 mol) was added dropwise tetramesyl pentaerythriol (b, 86.37 g, 77.8 mmol) in anhydrous acetonitrile (500 mL). The reaction was stirred under room temperature for three days. Upon completion, it was degassed for 2 days using an air pump. Then the pH of the residue was adjusted to 14 using 0.1 M NaOH aqueous solution. The aqueous phase was extracted with dichloromethane (500 mL×1, and 1 L×1). The organic phase was then dried over sodium sulfate and concentrated using a rotary evaporator to afford the product as a pale yellow oil (56.31 g). 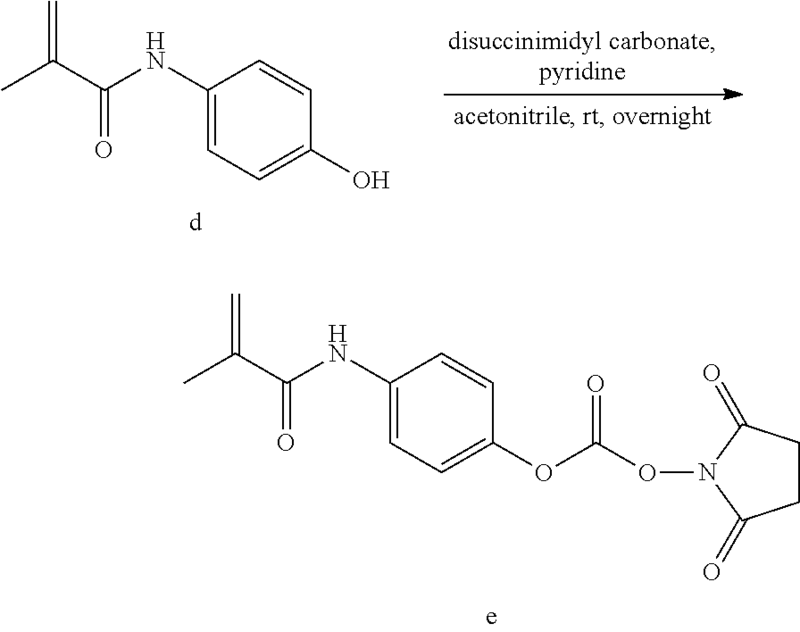 Preparation of NHS-activated (4-hydroxyphenylmethacrylamide) (e): To a solution of (4-hydroxyphenylmethacrylamide) (d, 20 g, 113 mmol) in anhydrous acetonitrile (78.8 mL) was added anhydrous pyridine (9.12 mL, 113 mmol) and disuccinimidyl carbonate (72.4 g, 283 mmol) sequentially. The solution was stirred for 18 hours at room temperature. Then the reaction was poured over dichloromethane (80 mL) and filtered over a Buchner funnel. The filtrate was washed with 2.5% aqueous copper sulfate solution (100 mL×1), and then saturated sodium chloride solution (100 mL×1). It was dried over sodium sulfate and concentrated under reduced pressure. The residue was passed through a short silica gel plug before being separated on flash chromatography using a gradient of ethyl acetate and dichloromethane. The product is a cream-colored solid (3.71 g, yield: 10.3%). 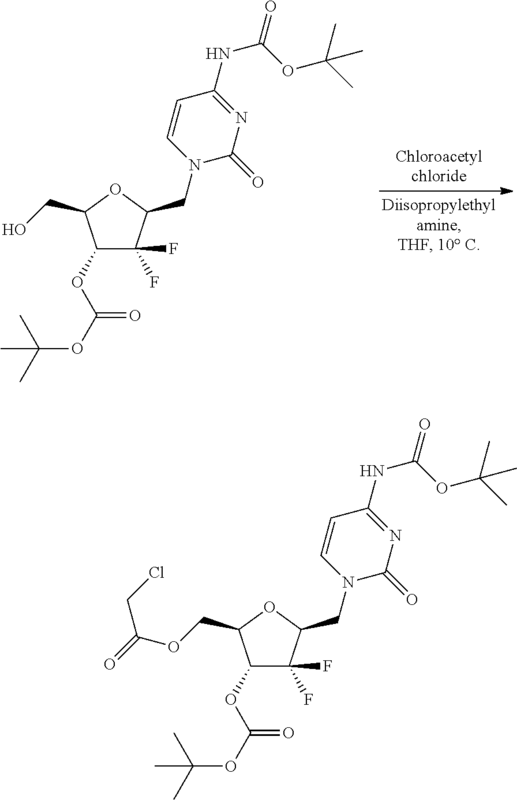 Preparation of a biodegradable crosslinker (f): To a solution of tetraamino pentaerythritol (c, 10.0 g, 12.6 mmol) and trimethylamine (7.0 mL, 50.4 mmol) in dichloromethane (67 mL) was added NHS-activated (4-hydroxyphenylmethacrylamide) (e, 16.0 g, 50.4 mmol) under argon. The solution was stirred for 3 hours 15 minutes. Upon completion, it was passed through a silica gel plug. The elution was using a rotary evaporator, and the residue was separated using flash chromatography to afford the product. 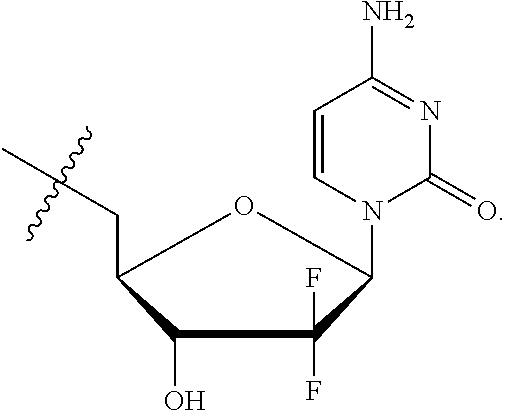 To 653 mg (1 mmol) of tetrapeptide Alanine-Proline-Glycine-Leucine (APGL) in 5 mL dry DMF was added 190 mg (1.1 mmol) of APMA-HCl, followed by 174 μL (1 mmol) of DIPEA, at room temperature with good stirring, under Ar. After 2 hr, the reaction mixture was treated with 20 mg of BHT and briefly exposed to air. LC-MS analysis showed (M+H)+ at 680 and (M+Na)+ at 702. Then, 5 mL of the reaction mixture was added dropwise to 200 mL of ether with good stirring and the solids which formed were collected by centrifugation. The resulting pellet was dissolved into 20 mL of (CHCl3/MeOH/MeOH+5% aqueous ammonia) 90/5/5, and applied to 50 g of silica gel in a 5×20 cm column (Aldrich 645524, 60 Angstrom 200-425 mesh). The silica gel column was developed with 500 mL of (CHCl3/MeOH/MeOH with 5% aqueous ammonia), 90/5/5. The peptide containing eluent (TLC, same solvent) was concentrated in vacuo to yield 110 mg of pale yellow oil, LCMS, as above. The pale yellow oil was dissolved in 10 mL of methanol and stored at −80° C.
A To prepare a filament loaded with a pharmaceutical agent, 1.34 g of sulfoethyl methacrylate, 0.66 g of the material described in Example 4, 0.1 g of pentaerythritol ethoxylate tetra-acrylate, and 0.025 g of azobisisobutyronitrile were dissolved in 3.4 g of dimethylformamide. The solution was sparged with Ar for 10 min before injection into 0.045 inch ID HYTREL® tubing using a 1 cc syringe. The tubes were heat sealed at both ends and placed in a 100° C. water bath for 1 hr, then overnight in an 80° C. oven to polymerize the solution. The hydrogel was removed by dissolving the tubing in a solution of 20% phenol in chloroform. After the tubing was dissolved, the phenol solution was exchanged with chloroform and washed for 1 hr. After 1 hr, the chloroform was exchanged and the hydrogel washed for another 1 hr. The chloroform was removed and the hydrogel dried in a vacuum oven for 2 hr at 25° C. To remove any unreacted monomers, the hydrogel was placed in ethanol for 12 hr. After 12 hr, the ethanol was exchanged and washed for 2 hr. After 2 hr, the ethanol was exchanged and the hydrogel washed for another 2 hr. The ethanol was removed and hydrogel dried in vacuo for 12 hr. The hydrogel filaments were placed in a 10 mg/mL solution of gemcitabine in water adjusted to pH 4.5 using ammonium hydroxide to load. After 45 min, the filaments were placed in ethanol for 2 hr for desiccation. The filaments were then placed in a room temperature vacuum oven overnight to remove the ethanol. 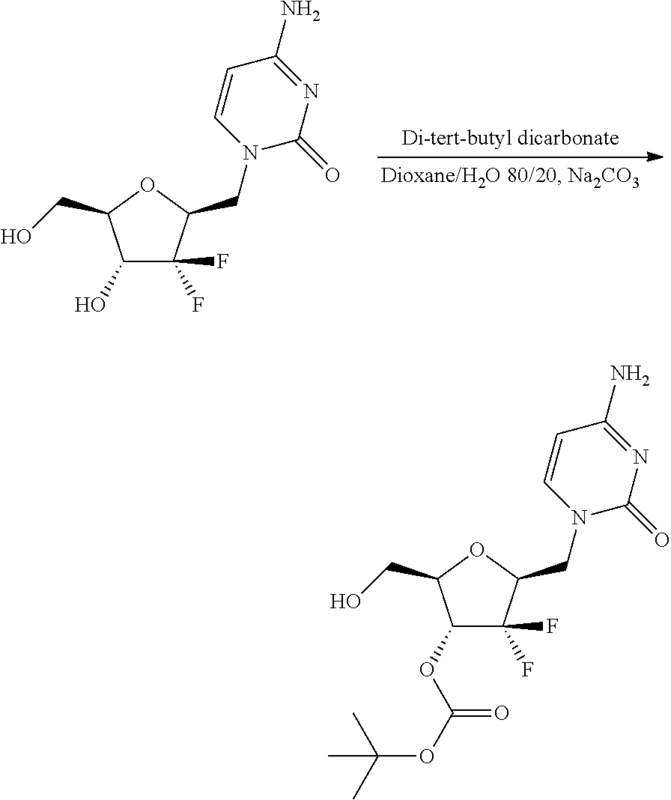 3′-O-(tert-Butoxycarbonyl)gemcitabine: To 3.0 g (10 mmol) gemcitabine in 200 mL of dioxane was added 2.2 g (10 mmol) of di-tert-butyl dicarbonate followed by 5.5 g of sodium carbonate and finally 50 mL of water, with good stirring under Ar. After stirring for 48 hr, the solvent was removed in vacuo and the residue distributed between 400 mL water and 1,000 mL of ethyl acetate. The aqueous layer was washed with an additional 500 mL of ethyl acetate, dried with sodium sulfate, and the solvent was removed in vacuo to give a colorless foam which was mostly one spot to TLC (50, 40, 10: CH2Cl2/acetone/ethanol), Rf of about 0.4. LC-MS showed (m+1)+ of 393.9. Silica gel chromatography on 4×30 cm column with 1:1:0.02-1:1:0.04, CH2Cl2/acetone/ethanol gave 2.1 g of material. 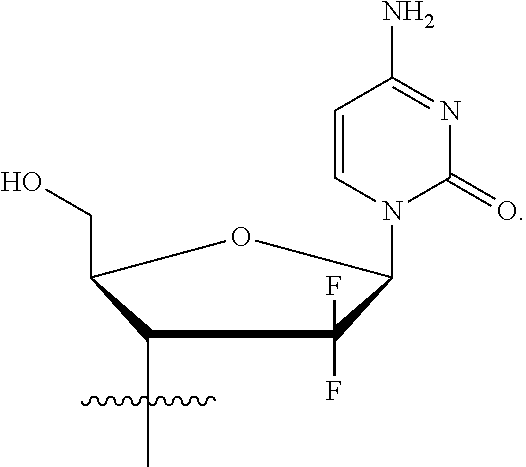 The NMR of this compound was the same as previously reported. (Acetone-d6/D2O). 4-N-3′-O-Bis(tert-Butoxycarbonyl)gemcitabine: To 2.1 g (6 mmol) of 3′-O-(tert-butoxycarbonyl)gemcitabine in 200 mL of dioxane was added 13.2 grams of di-tert-butyl dicarbonate and the reaction mixture was placed in an oven at 37° C. for 72 hr. At the end of this time, the solvent was removed in vacuo and the residue was placed on the vacuum line at 10 micron for 0.5 hr. The solids which formed were dissolved in 40 mL of CHCl3 and subjected to silica gel chromatography with a gradient of CHCl3 to 10% acetone in CHCl3, yielding 2.5 g of 4-N-3′-O-bis(tert-butoxycarbonyl)gemcitabine material whose NMR (Acetone-d6/D2O) was consistent with the proposed structure. 5′-O-chloroacyl-4-N-3′-O-Bis(tert-Butoxycarbonyl)Gemcitabine: To 926 mg (2.01 mmol) of 4-N-3′-O-bis(tert-butoxycarbonyl)gemcitabine in 15 mL of dry THF was added 0.4 mL (2.5 mmol) of diisopropylethyl amine followed by 0.2 mL (2.5 mmol) of chloroacetyl chloride, at −8.0° C. with stirring under Ar. TLC after 0.5 hour (10% acetone in CHCl3) indicated a complete reaction and at 40 min the reaction mixture was quenched with 20 drops of isopropyl alcohol and warmed to room temperature. THF was removed in vacuo and residue was taken up into 40 mL of CHCl3 and washed with 10 mL of water, dried with sodium sulfate, and the solvent was removed in vacuo to give a foamy semi-solid. Methacryoyl-5′-O-glycolyl-4-N-3′-O-Bis(tert-butoxycarbonyl)Gemcitabine: Foamy semisolids of 5′-O-chloroacyl-4-N-3′-O-bis(tert-butoxycarbonyl)gemcitabine (taken as 2 mmol) were taken up into 30 mL of dry DMF and treated with 955 mg (4.3 mmol) of cesium methacrylate at 50-80° C. for 4 hr. Solvent was removed in vacuo and brown residual oil was taken up into 150 mL of ethyl acetate and washed with portions of saturated aqueous sodium bicarbonate, dried over sodium sulfate. After solvents were removed, the residue was subjected to silica gel chromatography with a gradient of 2:1 hexane/ethyl acetate to 3:2 hexane/ethyl acetate to give a brown semi-solid whose NMR (acetone-d6/D2O) was consistent with the proposed structure. 2″-methacryoyl-5′-O-glycolyl-Gemcitabine: To 45 mg of methacryoyl-5′-O-glycolyl-4-N-3′-O-bis(tert-butoxycarbonyl)gemcitabine in 1.5 mL of dry methylene chloride was added 0.5 mL of trifluoroacetic acid dropwise at 0° C. with stirring under Ar. The reaction mixture was placed in a freezer overnight at −4° C. and in the morning the solvent was removed in vacuo. Then, repeated evaporations of 5 mL portions of methylene chloride were performed. After treating with several mL of triethyl amine and evaporating the excess, gradient silica gel chromatography with methylene chloride/acetone: 9/1 to methylene chloride/acetone/ethanol: 5/4/1 gave 35 mg, NMR (acetone-d6/D2O) consistent with proposed structure of 2″-methacryoyl-5′-O-glycolyl-gemcitabine. 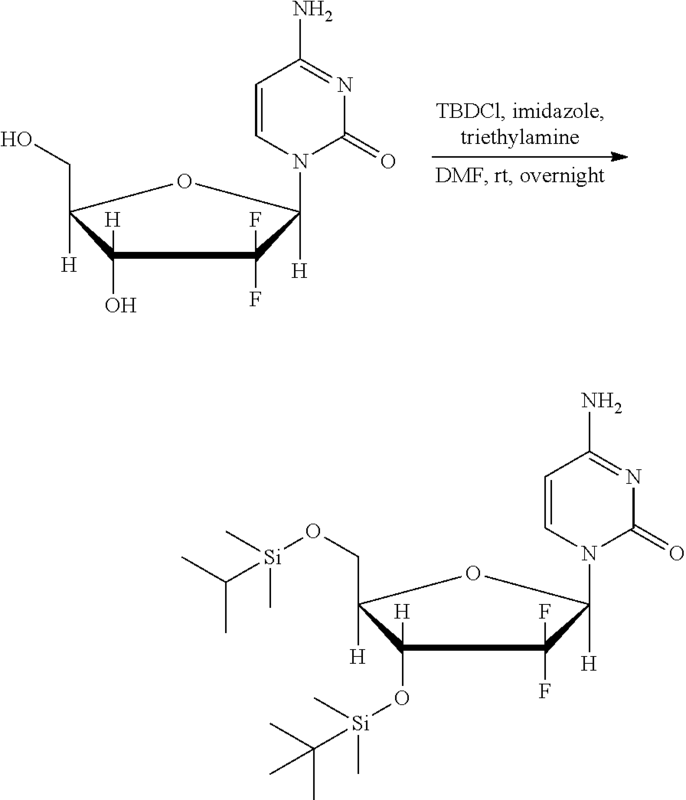 Preparation of 3′,5′-O-Bis-(tert-butyldimethylsilyl)-gemcitabine: To a stirring solution of gemcitabine hydrochloride (12 g, 40 mmol) in anhydrous dimethylformamide (240 mL) was added imidazole (8.17 g, 120 mmol) and tert-butyldimethylsilyl chloride (21.1 g, 140 mmol) sequentially. To the resulting solution was added trimethylamine (6.13 mL, 44 mmol) dropwise. The solution was stirred under room temperature for 15 hours. Then the reaction was filtered over a fritted glass funnel, and the filtrate was concentrated using a rotary evaporator. The residue was suspended in ethyl acetate (200 mL). The organic phase was washed with saturated sodium bicarbonate solution (200 mL×1) and then saturated sodium chloride solution (200 mL×1), before being dried over sodium sulfate. The solvent was removed using a rotary evaporator to afford the product as a yellow syrup (22.56 g). Preparation of 3′,5′-O-Bis-(tert-butyldimethylsilyl)-4-N-Boc-gemcitabine: To a solution of 3′,5′-O-bis-(tert-butyldimethylsilyl)-gemcitabine (3.04 g, 6.18 mmol) in dioxane (24 mL) was added 4-dimethylaminopyridine (105 mg, 0.86 mmol), triethylamine (5.2 mL, 37.1 mmol), and Di-tert-butyl dicarbonate (2.13 mL, 9.27 mmol). The reaction was stirred for 24 hours. Upon completion, it was poured over 60 mL ethyl acetate and washed with 75 mL saturated aqueous NaHCO3 solution. The organic fraction was dried over Na2SO4. The crude product (3.87 g) was separated using flash chromatography to afford the product as a clear solid (1.67 g, 45.6%). 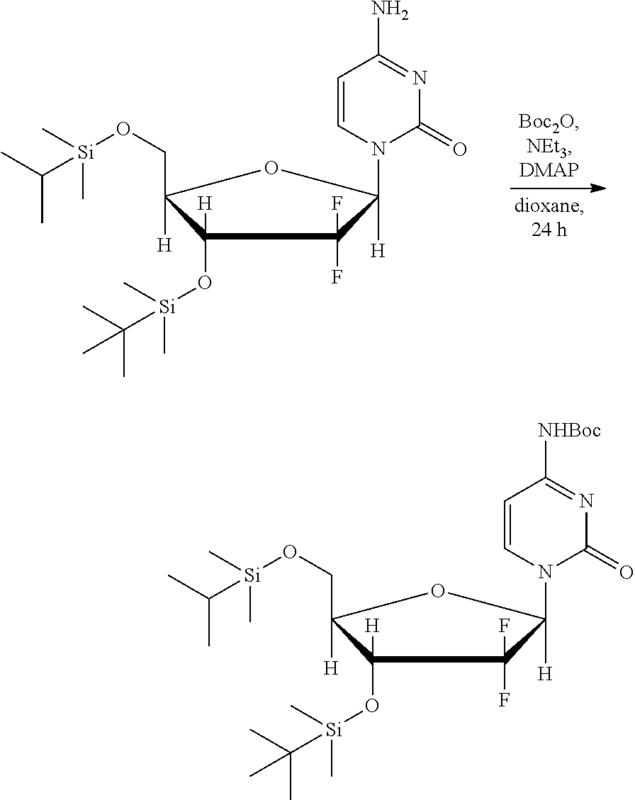 Preparation of the 4-N-Boc gemcitabine: To a stirring solution of 3′,5′-O-Bis-(tert-butyldimethylsilyl)-4-N-Boc-gemcitabine (7.67 g) in THF (477 mL) was added tetrabutylammonium fluoride (1 M in THF, 28.6 mL). The reaction was stirred for 30 min. Upon completion, the solvent was removed on a rotary evaporator. The reaction was worked up according to a published procedure. The crude product was separated on column using a gradient of DCM and acetone to afford the product as clear crystals. 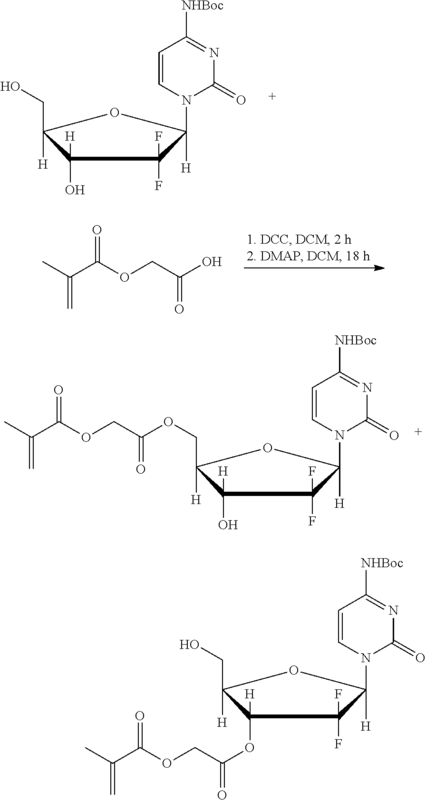 Preparation of carbomethoxymethyl methylacrylate: To a solution of 2-bromoacetic acid methyl ester (12.4 mL, 132.4 mmol) in THF (95 mL) at 0° C. was added methacrylic acid (9.3 mL, 110.4 mmol) and triethylamine (26.5 mL, 189.9 mmol). The reaction was then pulled out of the ice bath and stirred for 3 hours. Upon completion, a white precipitate was filtered off. The filtrate was kept and the solvent was removed on a rotary evaporator. The residue was resuspended in 100 mL H2O, and the aqueous phase was extracted with ethyl acetate (100 mL×2). The combined organic fractions were washed with saturated sodium chloride solution (100 mL×1) and dried over Na2SO4. The solvent was removed on a rotary evaporator, and the residue was subjected to distillation to obtain the product as a clear liquid with a pleasant aroma (13.97 g, 87.8%). Preparation of carboxymethyl methacrylate: A solution of carbomethoxymethyl methylacrylate (10.85 g, 75.3 mmol) in THF (276.9 mL) and solution of tetramethylammonium hydroxide (2.38%, 276.9 mL) in H2O (276.9 mL) were mixed and stirred for 3 hours. Then the solution was subjected to rotary evaporation to remove the THF. An aqueous solution of HCl (25%, 29 mL) was added to the aqueous phase to adjust the pH to approximately 3. The aqueous phase was extracted with ethyl acetate (200 mL×2). The ethyl acetate fraction was washed with H2O (200 mL×1) and saturated NaCl solution (200 mL×1) successively. It was dried over Na2SO4 and the solvent was removed on a rotary evaporator. The crystals were washed with petroleum ether to afford the final product as clear crystals (9.89 g, 55.8%). Preparation of 2″-methacryoyl-5′-O-glycolyl-4-N-Boc-Gemcitabine and 2″-methacryoyl-3′-O-glycolyl-4-N-Boc-Gemcitabine: To a solution of carboxymethyl methacrylate (0.25 g, 1.73 mmol) in DCM (10 mL) was added N, N′-dicyclohexylcarbodiimide (178.5 mg, 0.865 mmol). After 2 hours of stirring, a white precipitate was removed over a pad of celite. The filtrate was used directly for the next step. 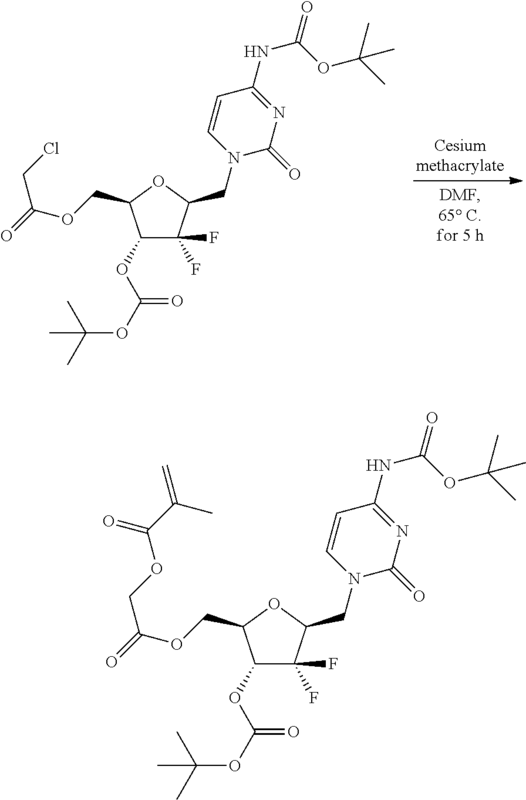 To a solution of 4-N-Boc gemcitabine (261.6 mg, 0.72 mmol) in DCM (10.6 mL) was added DMAP (8.8 mg, 0.072 mmol) and the filtrate. The reaction was stirred for 18 hours. Upon completion, it was washed with 5 mL saturated aqueous NaHCO3 solution. The organic fraction was dried over Na2SO4 and the solvent was removed using a rotary evaporator. The crude product was separated using flash chromatography to obtain the final product as a mixture of the 3′- and 5′-isomers (87.6 mg, 24.8%). Preparation of 2″-methacryoyl-5′-O-glycolyl-Gemcitabine and 2″-methacryoyl-3′-O-glycolyl-Gemcitabine: To a solution of 2″-methacryoyl-5′-O-glycolyl-4-N-Boc-Gemcitabine (87 mg, 0.178 mmol) in DCM (0.89 mL) was added trifluoroacetic acid (0.89 mL) at 0° C. The solution was stirred for 3.5 hours. Upon completion, the solvent was removed using a rotary evaporator. The residue was resuspended in 5 mL ethyl acetate. The organic phase was washed successively with 5% NaHCO3 solution (2.5 mL×2) and saturated NaCl solution (2.5 mL×1). The organic fraction was dried over Na2SO4 and the solvent was removed using a rotary evaporator. The crude product was separated using flash chromatography to afford the product as clear solids (32.9 mg, 47.5%). To 3.9 g (10 mmol) of SN-38 in 500 mL dry THF, at 0° C. was added 1.74 mL (10 mmol) of diisopropylethylamine followed by 2.96 g (10 mmol) of triphosgene (Aldrich) in 100 mL of THF, drop wise over 0.5 hr. After 1 hour at 0° C., the reaction mixture was transferred to a rapidly stirred flask containing 1.8 g of N,N′-dimethylethylenediamine (50 mmol) in dry THF. After 1 hour at room temperature, the solvent was removed from the reaction mixture in vacuo followed by an evaporation of 100 mL of DMF in vacuo to remove excess amines. The residue was placed on the vacuum line overnight. The next day, the residue from the vacuum line was dissolved into 500 mL of THF and 1.74 mL (10 mmol) of diisopropylethyl amine was added. After cooling the reaction mixture down to 0° C., 1.1 mL (1.15 mmol) of methacryloyl chloride was added in 100 mL of dry THF over 0.5 hour. After 1 hr of stirring at 0° C., the solvent was removed from the reaction mixture and the residue was flashed with 0-5% isopropyl alcohol in methylene chloride, to give the desired MA-bis-carbamate-SN-38 product. To a 50 mL water suspension of 2.5 g oxaliplatin a (6.30 mmol) being stirred for 10 minutes at 50° C., 125 mL of 30% H2O2 (1.22 mol) was slowly added as stirring at 50° C. continued. After the reaction mixture became homogeneous, the reaction was continued for an additional hour. Charcoal was added to deactivate the residual H2O2 and the mixture was stirred at room temperature overnight. Charcoal was removed by filtration and the water was removed under vacuum to obtain the dihydroxy oxaliplatin, b, which is a white solid. 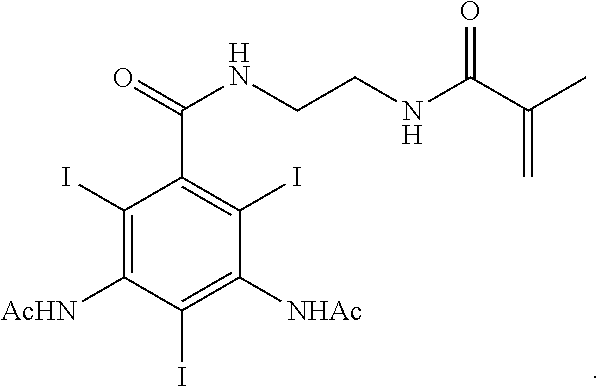 To a 100 mL anhydrous DMSO suspension of 800 mg dihydroxy oxaliplatin, b (1.856 mmol), 20 mL solution of 288 mg methacrylic anhydride (1.87 mmol) in anhydrous DMSO was added dropwise. The reaction mixture was stirred overnight at room temperature and became homogeneous. The DMSO was concentrated under vacuum at 55° C. till approximately 5 mL of solution was left. The product was precipitated by adding 200 mL of ether into the crude solution and stirring overnight. The solid was then collected via filtration and dried under vacuum for 8 hours. 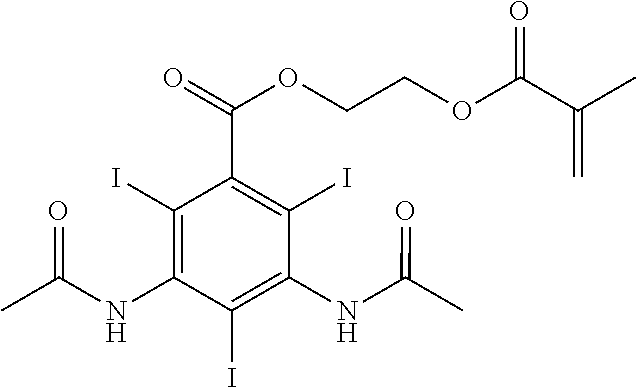 A total of 1.06 g of monohydroxy monomethacrylate oxaliplatin, c, was obtained with quantitative yield. To prepare a hydrogel filament with an incorporated active agent, 0.71 g of the polymerizable active agent prepared in example 8, 0.3 g of the material described in Example 4, 0.2 g of TMP lac/gly, and 0.02 g of azobisisobutyronitrile were dissolved in 1.25 g of dimethylformamide. The solution was sparged with argon for 10 min before injection into 0.045 inch ID HYTREL® tubing using a 1 cc syringe. The tubes were heat sealed at both ends and placed in a 100° C. water bath for 1 hr, then overnight in an 80° C. oven to polymerize the solution. The hydrogel was removed by swelling the tubing in chloroform allowing the filament to be peeled from the tube. The hydrogel was washed in isopropanol for 1 hr to remove any unreacted components, then vacuum dried for 72 hr at room temperature to remove any residual alcohol. Samples of gemcitabine loaded filaments prepared as described in Example 1, Example 7, and Example 10 were placed in 5 mL of saline and incubated at 37° C. At various time points, the saline was sampled and exchanged with fresh saline. 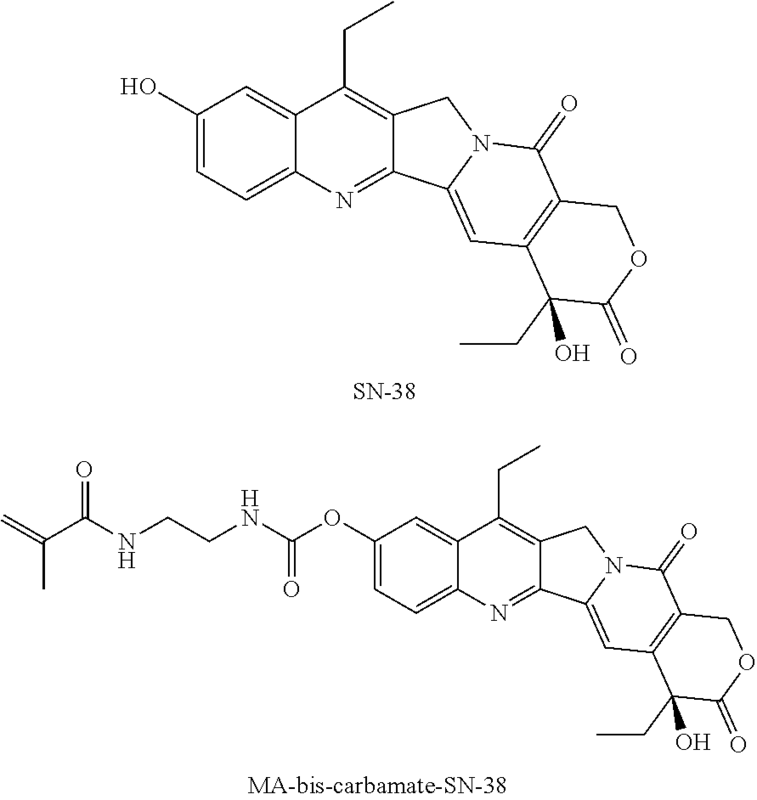 The amount of gemcitabine in the saline samples was determined by high performance liquid chromatography and illustrated in the Table below and in FIG. 1. The results illustrate the potential difference between quick, short term release by entrapping or loading the drug into the filament and a slow long term release by incorporating the drug into the hydrogel filament. The preceding disclosures are illustrative embodiments. It should be appreciated by those of skill in the art that the devices, techniques and methods disclosed herein elucidate representative embodiments that function well in the practice of the present disclosure. However, those of skill in the art should, in light of the present disclosure, appreciate that many changes can be made in the specific embodiments that are disclosed and still obtain a like or similar result without departing from the spirit and scope of the invention. The terms “a” and “an” and “the” and similar referents used in the context of describing the invention (especially in the context of the following claims) are to be construed to cover both the singular and the plural, unless otherwise indicated herein or clearly contradicted by context. Recitation of ranges of values herein is merely intended to serve as a shorthand method of referring individually to each separate value falling within the range. Unless otherwise indicated herein, each individual value is incorporated into the specification as if it were individually recited herein. All methods described herein can be performed in any suitable order unless otherwise indicated herein or otherwise clearly contradicted by context. The use of any and all examples, or exemplary language (e.g. “such as”) provided herein is intended merely to better illuminate the invention and does not pose a limitation on the scope of the invention otherwise claimed. No language in the specification should be construed as indicating any non-claimed element essential to the practice of the invention. Groupings of alternative elements or embodiments of the invention disclosed herein are not to be construed as limitations. Each group member may be referred to and claimed individually or in any combination with other members of the group or other elements found herein. It is anticipated that one or more members of a group may be included in, or deleted from, a group for reasons of convenience and/or patentability. When any such inclusion or deletion occurs, the specification is herein deemed to contain the group as modified thus fulfilling the written description of all Markush groups used in the appended claims. Preferred embodiments of this invention are described herein, including the best mode known to the inventors for carrying out the invention. Of course, variations on those preferred embodiments will become apparent to those of ordinary skill in the art upon reading the foregoing description. The inventor expects those of ordinary skill in the art to employ such variations as appropriate, and the inventors intend for the invention to be practiced otherwise than specifically described herein. Accordingly, this invention includes all modifications and equivalents of the subject matter recited in the claims appended hereto as permitted by applicable law. Moreover, any combination of the above-described elements in all possible variations thereof is encompassed by the invention unless otherwise indicated herein or otherwise clearly contradicted by context. Specific embodiments disclosed herein may be further limited in the claims using consisting of or consisting essentially of language. When used in the claims, whether as filed or added per amendment, the transition term “consisting of” excludes any element, step, or ingredient not specified in the claims. The transition term “consisting essentially of” limits the scope of a claim to the specified materials or steps and those that do not materially affect the basic and novel characteristic(s). Embodiments of the invention so claimed are inherently or expressly described and enabled herein. Furthermore, numerous references have been made to patents and printed publications throughout this specification. Each of the above cited references and printed publications are herein individually incorporated by reference in their entirety. Further, it is to be understood that the embodiments of the invention disclosed herein are illustrative of the principles of the present invention. Other modifications that may be employed are within the scope of the invention. Thus, by way of example, but not of limitation, alternative configurations of the present invention may be utilized in accordance with the teachings herein. Accordingly, the present invention is not limited to that precisely as shown and described. 2. 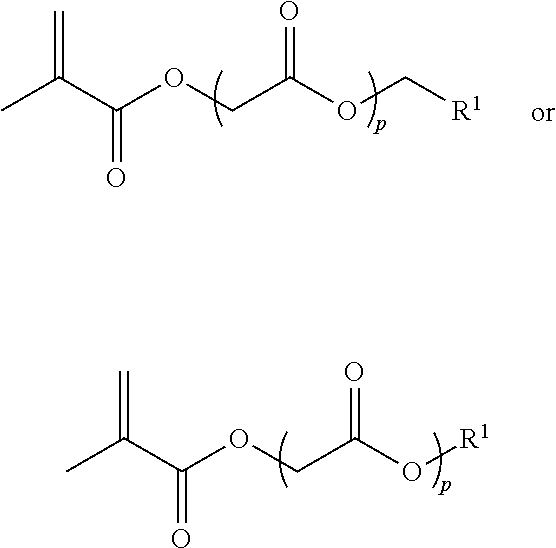 The polymer filament of claim 1, further comprising at least one monomer selected from t-butyl acrylamide, 2-hydroxyethyl methacrylate, hydroxyl propyl acrylate, hydroxyl butylacrylate, or a combination thereof. 3. The polymer filament of claim 2, wherein the at least one monomer has a concentration of between about 5% and about 40% w/w of the prepolymer solution. 4. The polymer filament of claim 1, wherein the at least one macromer has a concentration of between about 15% and about 25% w/w of the prepolymer solution. 5. The polymer filament of claim 1, wherein the at least one macromer has a molecular weight of between about 100 g/mole and about 5,000 g/mole. 6. The polymer filament of claim 1, wherein the polymer filament does not include metallic support members. 7. The polymer filament of claim 1, wherein the polymer filament is configured for delivery through a catheter. 9. 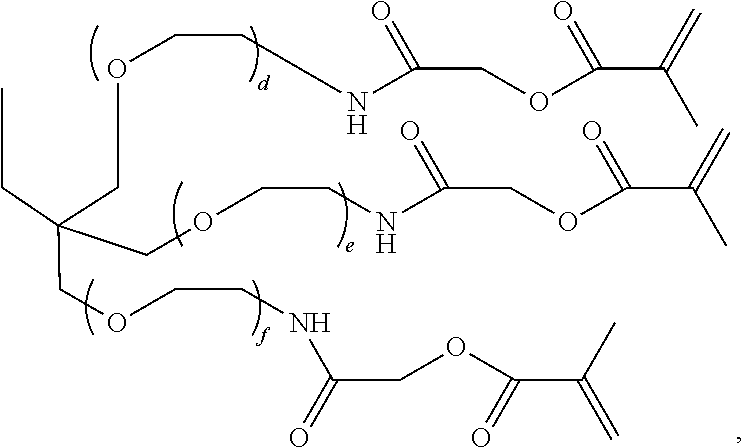 The polymer filament of claim 8, further comprising at least one monomer selected from t-butyl acrylamide, 2-hydroxyethyl methacrylate, hydroxyl propyl acrylate, hydroxyl butylacrylate, or a combination thereof. 10. The polymer filament of claim 9, wherein the at least one monomer has a concentration of between about 5% and about 40% w/w of the prepolymer solution. 11. 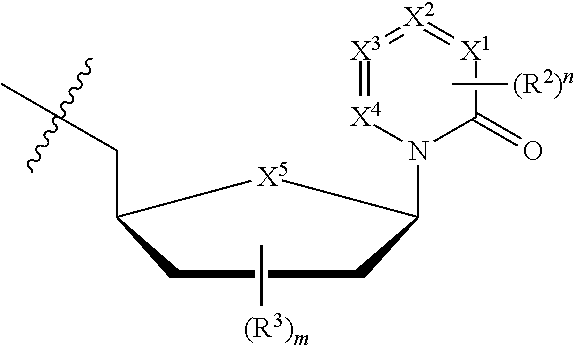 The polymer filament of claim 8, wherein the at least one macromer has a concentration of between about 15% and about 25% w/w of the prepolymer solution. 12. The polymer filament of claim 8, wherein the at least one macromer has a molecular weight of between about 100 g/mole and about 5,000 g/mole. 13. The polymer filament of claim 8, wherein the polymer filament does not include metallic support members. 14. The polymer filament of claim 8, wherein the polymer filament is configured for delivery through a catheter. International Search Report and Written Opinion dated Sep. 23, 2016 for International Application No. PCT/US2016/036924 filed on Jun. 10, 2016.
International Search Report dated Dec. 17, 2010 for International Patent Application No. PCT/US2010/053972. Persidis, A., Tissue engineering. Nature Biotechnology, 17, Abstract only (1999). Supplementary European Search Report for EP Application No. 15785350 dated Nov. 13, 2017. Vinuela et al., Guglielmi detachable coil embolization of acute intracranial aneurysm: perioperative anatomical and clinical outcome in 403 patients. J. Neurosurg., vol. 86, pp. 475-482 (1997). 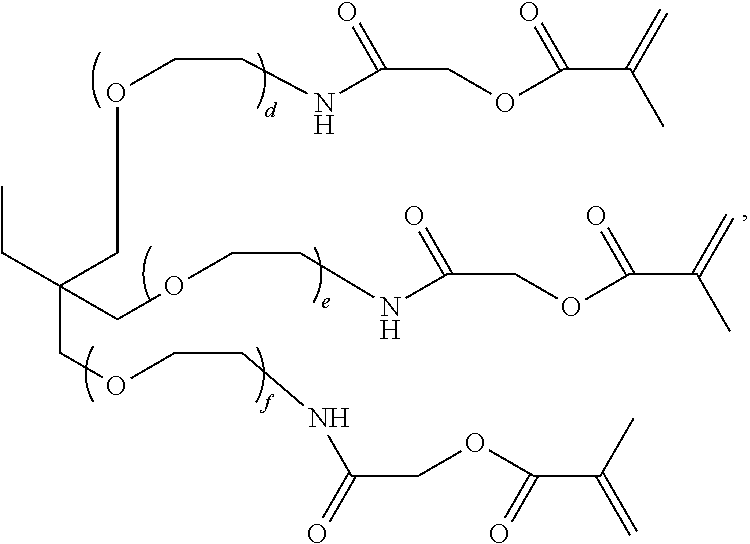 ES2198579T3 (en) 2004-02-01 hydrolysable hydrogels for controlled release. 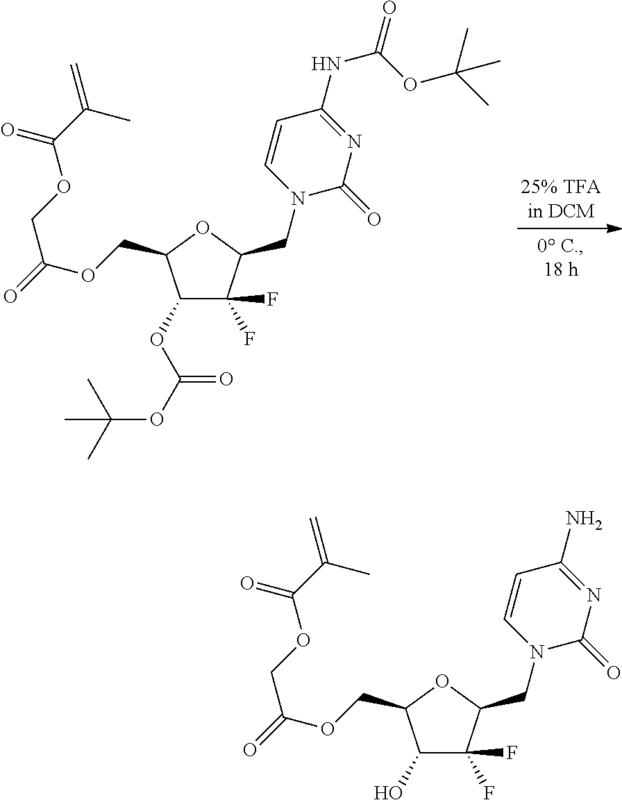 ES2261934T3 (en) 2006-11-16 occlusive composition comprising a poly (2-cyanoacrylate) monomer.